What are Jira post functions? Note that there are three techniques to implement automatic processes with Better Excel Exporter for Jira. To be sure that the XLS API is the best for you, read the Automation article before this one. 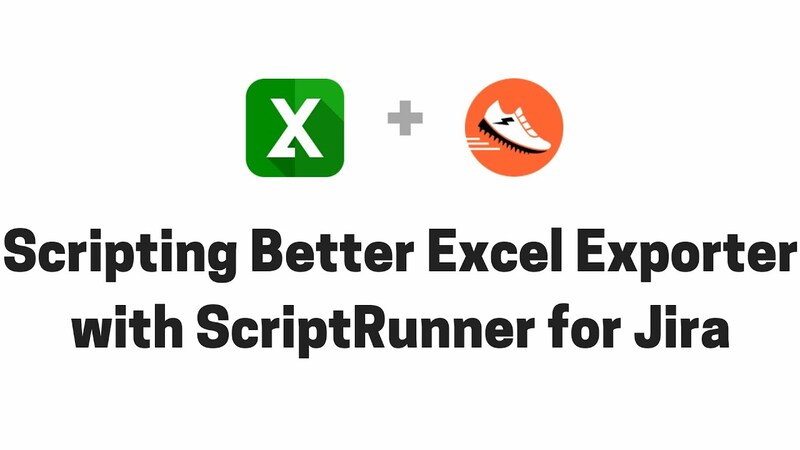 Better Excel Exporter for Jira provides a lightweight in-process API (Application Programming Interface) for the programs that run in Jira's JVM and want to generate Excel spreadsheet from Jira data. For sake of simplicity, this interface is called the XLS API. Groovy would be Midori's primary choice of language. Groovy is a very powerful dynamic scripting language that allows you to reuse your Java experience, and also making you super productive when building small Jira extensions. Midori believes that instead of building those extensions in pure Java and maintaining full-blown Jira apps, writing short and concise Groovy scripts and executing them with the popular ScriptRunner app is the most easiest way to implement custom integration logic. Java should be used when building some "really big" app (with its own user interface, model and persistence, and so on), or when adding the Excel spreadsheet exporting functionality to an existing app written in Java. Please note that all examples in this article will be written in Groovy and will rely on the ScriptRunner app. It is totally trivial to port them to Java. As always, and you are welcome to contact us with your questions. * This is a convenience method to render Excel spreadsheets from single issues. * @see #getXls(String, String, List, Map) For parameters, see the API call that supports multiple issues. * Renders Excel spreadsheets from the passed issues using the specified template. * @param title the title for the resulted Excel spreadsheet. * @param issues the issues to be exported in the Excel spreadsheet. * @return the result object containing the Excel spreadsheet filename and its actual bytes. In the future, we plan to add further API methods, to query the templates defined, to allow creating, modifying or deleting templates and so on. Please contact us any time if you need some functionality exposed through the XLS API. We are happy to help. // Reads the stream returned by getInputStream() to a byte array, and returns that. // grow large, use the stream getter (see next) instead. // will already be consumed. To make it even easier, Midori provides a small open source integration library for the Better Excel Exporter for Jira. It is called IntegrationUtils, and its aim is to provide ready-made utility functions for the most frequent problems. Functions include rendering Excel spreadsheets with a single method call, running a saved Jira filter, sending an email, adding an issue comment and so on. All the examples in this article rely on the IntegrationUtils library. You are encouraged to look into the IntegrationUtils.groovy file to see what functions are available, and copy or modify those to your needs. Using the XLS API in Java is simple, as well. For this you should be familiar with the basics of Jira app development. If you could use some sample code or you have some questions, please ask our engineers any time. How to access the API? In the following sections, there are complete step-by-step guides for all major use cases. If those are not 100% applicable to your situation, you are more than welcome to ask us any time. Please note that there is a similar video available for the companion product called Better PDF Exporter. That video demonstrates the "send PDF at workflow transitions" use case. That is a perfect guide to implement "send Excel at workflow transitions" even if the file formats are different! Advanced workflow configuration (Jira Administrator's Guide) - read about workflows, post functions and transition properties. Post function examples with the ScriptRunner app (ScriptRunner app documentation) - several post function examples in Groovy. After you understood transitions and post function, continue reading the next sections to implement post functions that integrate Excel spreadsheet exporting to your workflows. Copy both files to a directory that is visible for Jira, e.g. /path/to/my/post-functions. Set the name of the template file, the title for document and possibly other settings in the section starting with "// XLS configuration". Set the email subject, email body, target email address, etc. in the section starting with "// email configuration". Now open your browser, and login to Jira as Jira administrator. Go to Administration → Issues → Workflows. Click the transition you want to add the post function to. Click the Post Functions tab, then click Add post function. Jira 6.x: select the Script Post-Function type, and enter the full path of SendIssueXlsPostFunction.groovy to the Script file path input box. After submitting it, the new post function is added in the first position of the post function chain. Click Move Down several times to move it to last position (safest). If you were working on a workflow draft, don't forget to publish your changes at this point. If you forget it, your changes will not be used. Set the path, which specifies the full filesystem path where to write the Excel spreadsheet to, in the section starting with "// file configuration". Jira 6.x: select the Script Post-Function type, and enter the full path of ExportIssueXlsPostFunction.groovy to the Script file path input box. So far we suggested you to configure the post function variables (like the target email address) right in the scripts. There is an interesting configuration alternative by using transition properties. Jira allows defining named properties for each transition. A property consists of a text key and a text value. The idea is that post function code can access those properties, and they can be used to override the script variables. This basically means, that if you set the variable "title" to "Foo" in the Groovy post function script and also add the property "title" (same name!) with the value "Bar" to the transition that executes the post function, then the transition property takes the precedence, and title will be equal to "Bar". OK, what's the point? The point is that you can edit the transition properties through the Jira web interface, without dealing with the Groovy files. In typical Jira instances, it is very hard to get access to the filesystem and edit the Groovy files directly. If you have Jira administration permissions, no need for this, you can easily re-configure your post functions by editing the transition properties. Also the configuration is captured at the transition, therefore the script itself can exist only as a single instance, no need for variations. The second parameter is the property key. The third parameter is the default value (which will be used if the transition property is not defined). It will be evaluated when executing the getWorkflowTransitionProperty() method, and the result "TEST-1 export at 2017/10/15" will be assigned to "title"! It may sound overwhelming for the first read, but please believe, it is totally straightforward to use. If your transition fail or you don't receive the emails, the number one advice is: check your log! The error and the root cause will very likely be written there. So, just increase the logging level to DEBUG for the logger SendIssueXlsPostFunction.groovy and you will see what's going on by watching the Jira log. Jira services allow you executing routine work periodically. With the ScriptRunner app you can write custom services in Groovy. Utilizing these, this section explains how to generate and email Excel spreadsheets Jira issues periodically. A typical example can be sending a weekly report as Excel spreadsheet email attachment in every seven days. Copy both files to a directory that is visible for Jira, e.g. /path/to/my/services. Set the username of the user which will be used to run the filter, the ID of the filter and some other settings in the section starting with "// XLS configuration". Go to Administration → System → Services. Enter a descriptive name like "XLS Task Report Sender Service". Set Delay to the length of the period in minutes. Set this to a relatively low value, like 1, for the testing period to send a test email every minute (Cron Expression: * * * * * ?). When it looks OK, set it to 60 minutes for an hourly report, or 1440 for a daily report. In the next screen, enter the path of the Groovy script to Input File. This should be something like /path/to/my/services/SendFilterXlsService.groovy. Don't forget to set the final Delay and to have some chocolate when you are done. Sometimes you need to export just a single issue, not a full filter, periodically. This section explains how to implement that in 5 minutes. Set the username of the user which will be used to run the filter, the key of the issue and some other settings in the section starting with "// XLS configuration". In the next screen, enter the path of the Groovy script to Input File. This should be something like /path/to/my/services/SendIssueXlsService.groovy. Service script errors should be inspected in the same way as workflow transition script errors, described in the workflow troubleshooting section.